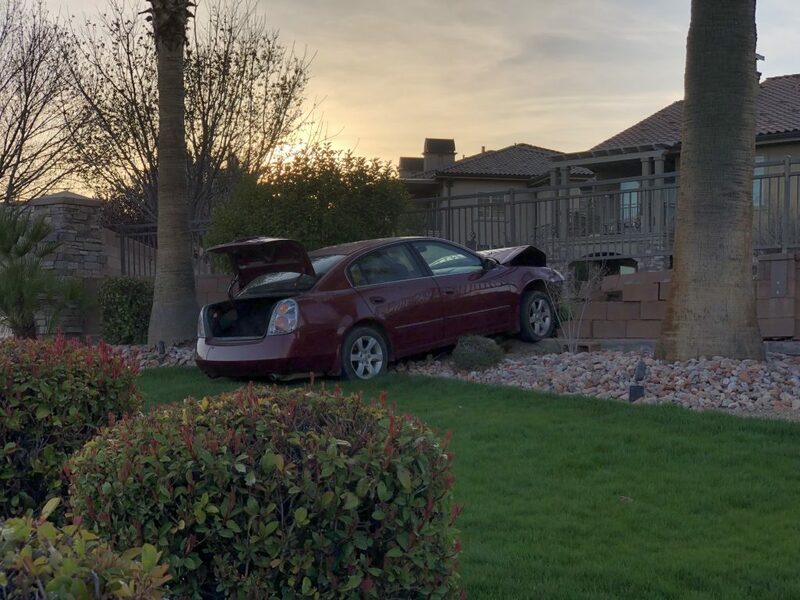 ST. GEORGE — A man was cited for failing to secure his truck’s load after a passenger car being towed behind the pickup came loose on Dixie Drive and crashed into a brick wall Monday evening. 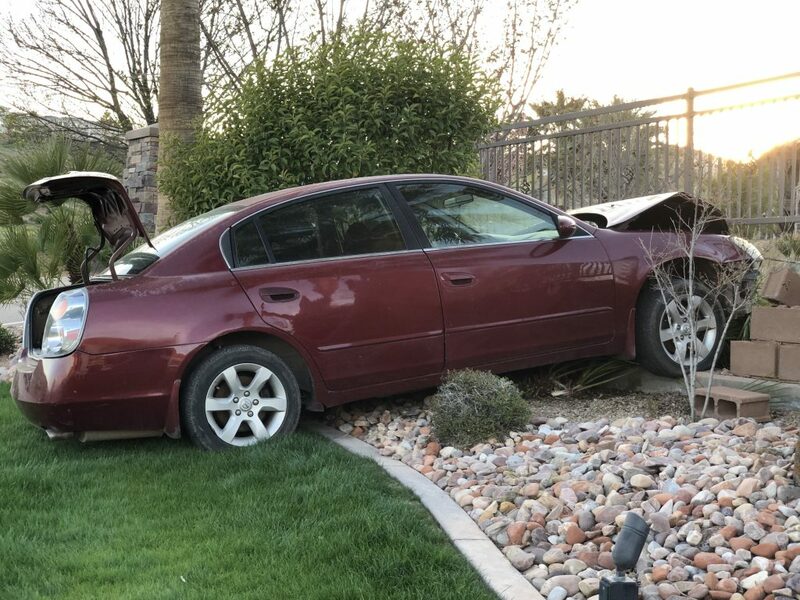 Police responded to the crash just before 7 p.m. involving a small red pickup truck towing a maroon Nissan Altima near the intersection of Dixie Drive and Canyon View Drive. No one was in the passenger car at the time of the crash, and no injuries were reported. 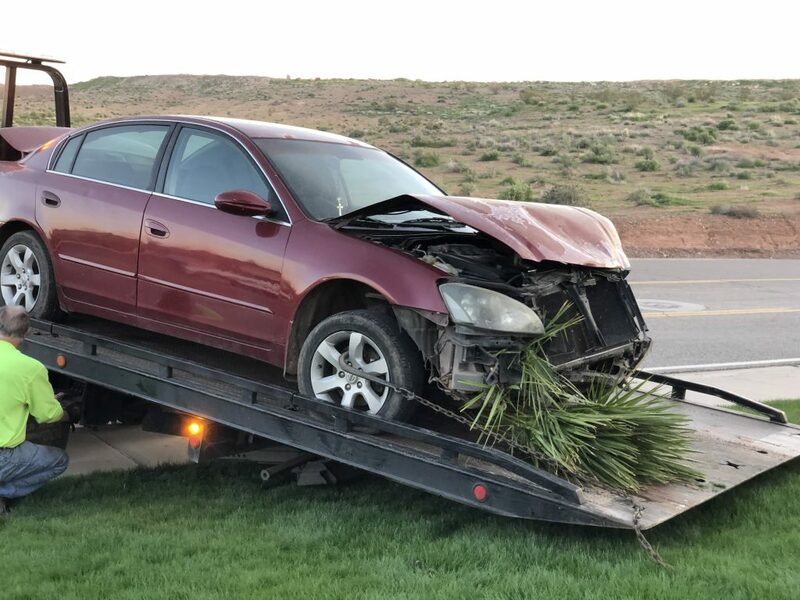 The driver of the pickup was traveling on Dixie Drive when the passenger car came loose, St. George Police spokeswoman Tiffany Atkin said. 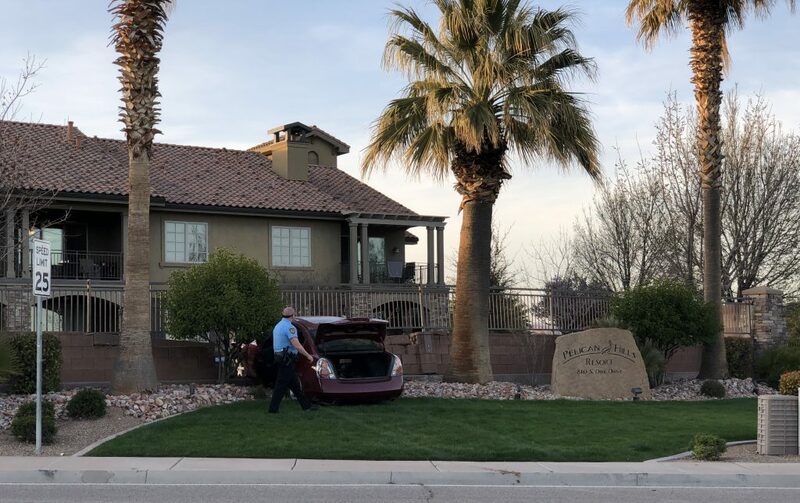 When it detached from the pickup, the Nissan reportedly veered across the road in front of several vehicles before jumping the curb, mowing over some landscaping and crashing into a brick wall surrounding the Pelican Hills Resort on the northwest corner of Canyon View Drive and Dixie Drive. 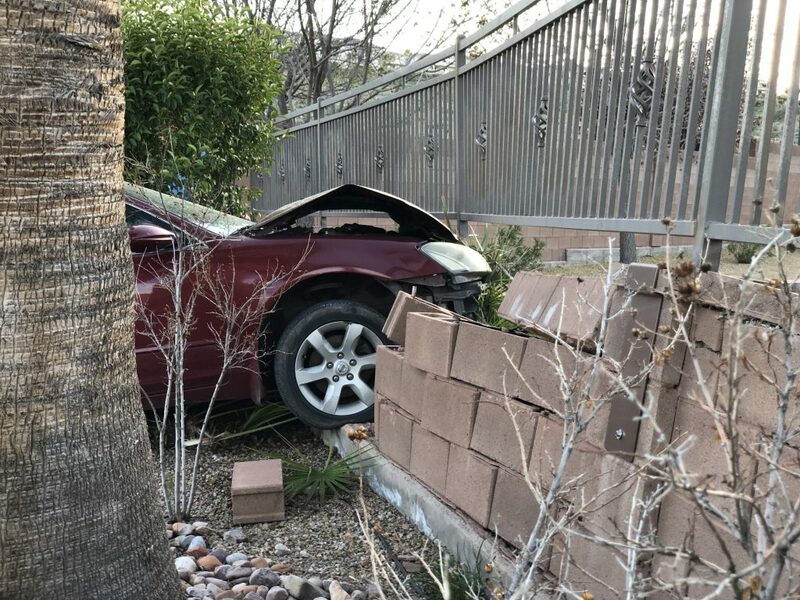 The brick wall partially crumbled from the impact of the crash, leaving behind a gaping hole in which the Nissan became lodged. 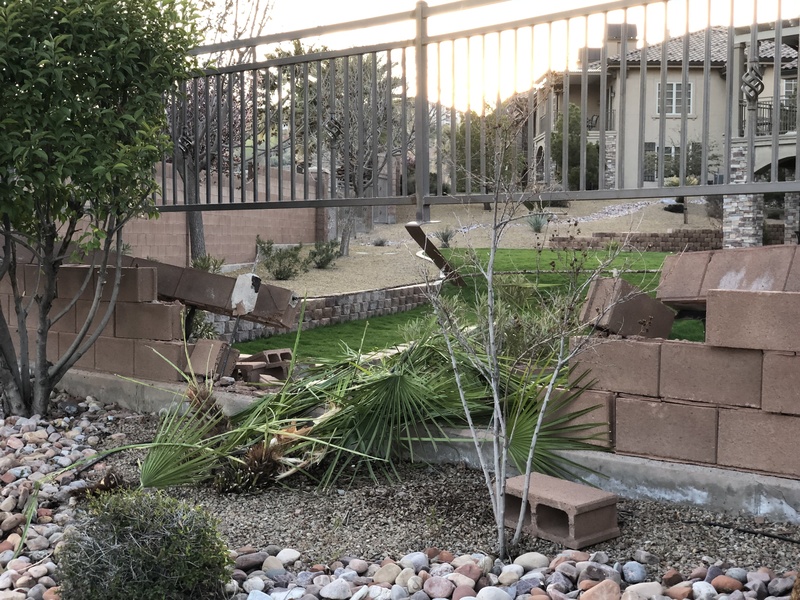 Some metal fencing atop the brick wall was also loosened and bent on impact. 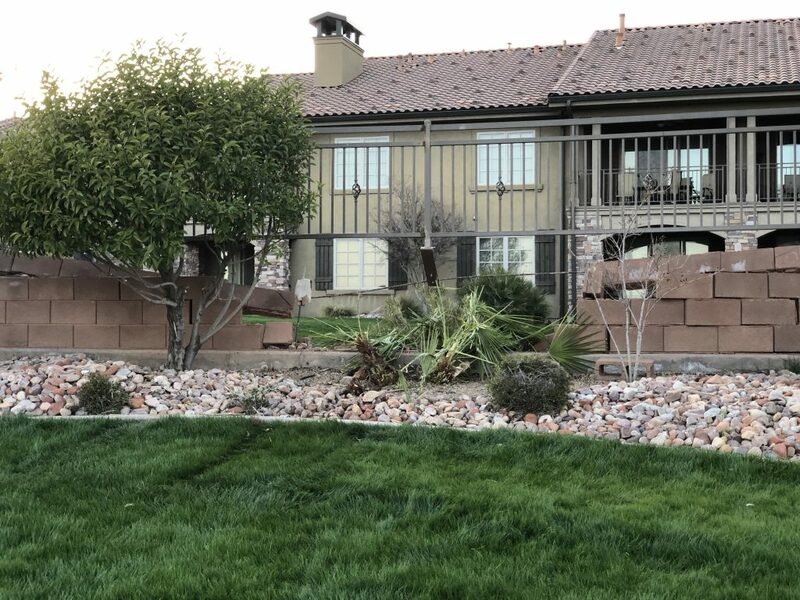 A yucca landscaping feature was ripped to shreds, and part of it became stuck in the front end of the car. After the crash, the driver of the pickup pulled into the Pelican Hills Resort parking lot where he spoke with police. Atkin said he was cited for not having a license and failing to secure a load leading to an accident, a class B misdemeanor. The driver will also be responsible for the property damage resulting from the crash. The Nissan’s front end was heavily damaged. After prying it lose from the wall, a wrecker towed the car away. Westbound traffic on Canyon View Drive near the intersection was blocked for about 20 minutes as the tow truck was being operated.